Carrying notebook and camera, Tom Weissling wades through waist-high grass and plants at Nine Mile Prairie west of Lincoln, Neb. The associate professor in the University of Nebraska-Lincoln’s Department of Entomology periodically stops, looks closely at plants and takes notes and pictures. It’s how he spent a lot of his summer, combing the state for signs of something that’s getting harder to find: monarch butterflies. Weissling is also looking for milkweed. The connection is important because monarchs lay their eggs exclusively on milkweed, and it’s the only thing the larvae will eat. Weissling’s rough survey took him to about two-thirds of Nebraska’s counties, and is something of a starting point in determining the decline of monarchs in the state. An Iowa State University report estimated an 81 percent decline in the monarch population in the Midwest between 1999 and 2010, with a 58 percent decline in milkweed presence during the same time. The reasons behind the decline in monarchs can be controversial. 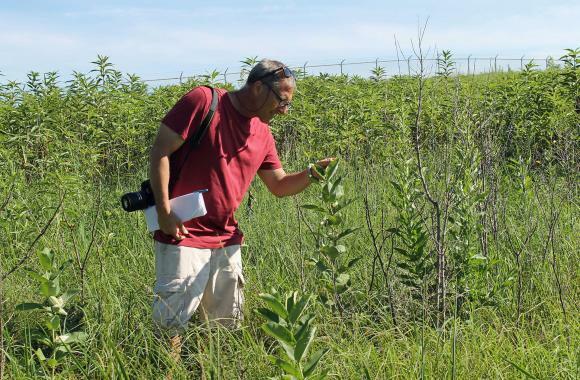 Some say milkweed loss is caused by increased use of agricultural herbicides. Others point to a loss of forestland in Mexico where monarchs winter, and temperature fluctuations. Regardless of the cause, Hovorka said these are big changes that require a big response. Nebraska may develop a statewide conservation plan, Hovorka says, and strategies for increasing milkweed. Weissling said they could also work on convincing businesses and homeowners to embrace milkweed as an addition to their landscaping, and just think differently about where milkweed could be allowed to grow. It could take a lot of milkweed to reverse the trend. Hovorka said the U.S. Fish and Wildlife Service is talking about a five-year goal of having a milkweed presence on 7 million acres nationally, primarily in the Great Plains. He said a million of those acres could be in Nebraska. Nebraska Game and Parks has already started doing some of this work. That includes working with partner organizations in September to plant 3000 milkweed seedlings along stretches of the Cowboy Trail, a Game and Parks recreational trail that runs from Norfolk to Valentine. The project was funded by a $150,000 grant from the National Fish and Wildlife Foundation. "Federally and regionally and within the state, there’s just a groundswell of interest right now in making sure monarchs are doing better than they appear to be doing the past few years," Taylor added. Bringing back monarch habitat, Hovorka says, is particularly important because it has a broader impact than the loss of butterflies. "We have bees and other pollinators that are critically important to the ag economy and to growing some of the foods that we have," Hovorka said. "So it's not just about losing monarch habitat. We're losing bees. We're losing the other pollinators. The monarch is sort of the big, flashy, bright species that people love. It's an easy thing to talk about. But what we really need to do around the landscape, while we’re restoring habitat for monarchs, we’re also restoring habitat for bees, for other pollinators, we’re diversifying the prairies that we have, and so that's good for a lot of different kinds of wildlife." Back at Nine Mile Prairie this summer, Weissling flipped over a milkweed leaf to expose a yellow and black striped monarch caterpillar. He found 14 of these during his statewide summer survey, but said the statistics are more starting point than barometer at this stage. Just another part of an effort Weissling hopes will save what he calls the bald eagle of American insects. Those royally beautiful creatures, monarch butterflies, are declining in numbers, partly because a certain weed is disappearing, especially across the American Midwest. 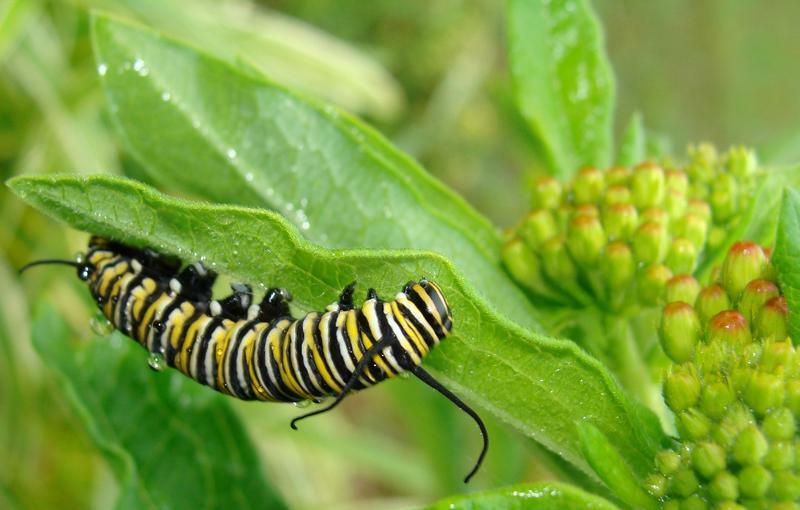 The monarch butterfly caterpillar depends on milkweed to survive. And that's something you can help with by planting milkweed, which is really a pretty flower in your garden. I know. I have lots of milkweed in mine and lots of monarchs. From member station KBIA, Sara Shahriari has more.